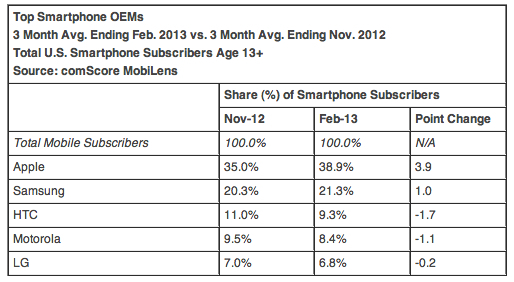 New data from research firm comScore puts Apple firmly out in front with regards to smartphone ownership in the US. The Cupertino company ranked top for the three months ending February 2013, taking a 38.9 percent share of the OEM (original equipment manufacturer) market. This marks a healthy 3.9 percent jump from the previous three months, and helps Apple to increase its lead in the US market over its main rival, Samsung. According to comScore, Samsung-made smartphones now account for 21.3 percent of the US market, an increase of one percentage point on the previous three-month period. 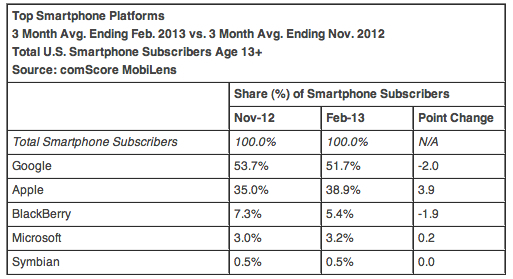 For other smartphone makers, the statistics are a bit on the grim side. HTC sits in third place with 9.3 percent of the market, indicating a slip of 1.7 percent, though the Taiwanese company will be hoping for a boost in the coming months with the release of its flagship HTC One handset. Motorola and LG also saw their market share drop. While Google’s Android platform continues to dominate, with 51.7 percent of the market, the figure represents a drop of 2 percent. Apple executives are likely to be feeling a warm glow of satisfaction, however, with its 3.9 percent increase, taking it to 38.9 percent. After Apple you have BlackBerry, with just 5.4 percent of the market, dropping 1.9 percent. Keep in mind, however, that this data was collected before the Z10 launched in the US, so you can expect to see some improvement for BlackBerry in comScore’s next bundle of statistics. The same goes for Samsung, with the recent launch of its top-of-the-range Galaxy S4 handset possibly causing some consumers to stay out of the market as they wait for availability. 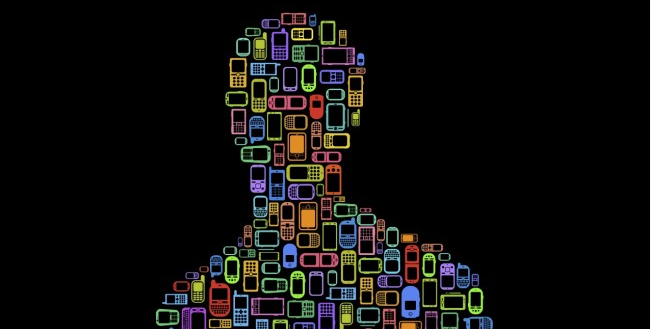 comScore’s latest data, taken from a survey of a nationally representative sample of mobile subscribers, shows that smartphone ownership in the US continues to grow at quite a pace, with an 8 percent rise on the previous-three month period. The research company said 133.7 million people in the country now own such a device, putting mobile market penetration at 57 percent.